Aquí puede consultar todos los accesorios para esta línea de productos. The mild steel single door wall mounted enclosure range, MAS, with a IP 66 protection degree, is available off the shelf in many different sizes. This enclosure range is well suited for many different applications. The risk for component failure, and with that unnecessary downtime, is eliminated as water and dust are prevented from entering the enclosure. Body: 1.4 mm for enclosures with a depth of 210 or 260 mm / 1.5 mm for enclosures with a depth of 300 or 400 mm, or if a height or width is 1000 mm or greater. Door: 1.5 mm / 2 mm for enclosures with a height or width of 800 mm or greater. Folded and seam welded. Four 8.5 mm diameter holes for wall fixing, pressed out in 20.4 mm diameter x 2 mm depressions to allow air circulation around the rear part of the enclosure. Surface mounted with 130º opening. Concealed removable hinges with captive pin. Hinges can be mounted to allow left or right hand opening. There are studs to mount door profiles MMDP included as standard. Sealing is ensured by an injected one piece polyurethane gasket. Customized lock with double-bit for easy opening of the door. Double-bit 3 mm insert and 90º movement. 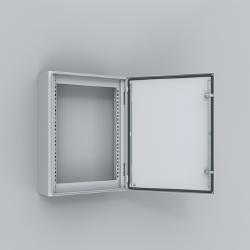 1000 mm high enclosures and above have espagnolette three point locking. Other inserts are available as an accessory. IP 55, 66 | TYPE 4, 12, 13 | IK 10. For outdoor installation the use of a rain hood ARF and 100% polyester paint coating is recommended. The corrosion resistance must be taken into consideration. RAL 7035 structured powder coating. Eclosure with door and two door mouting profiles, from MAS0604015R5 and above. Gland plate(s) with gasket, plastic double-bit key and mounting accessories. MAS1006026R5 and above, come with a mettalic key. Earthing facilities. Mild steel single door wall mounted enclosure, available in a wide range of sizes with a high IP 66 protection degree. Customers can choose enclosures that meet their size requirements, off the shelf. The installed components inside the enclosure will be safe and secure due to the high protection degree. Customers can receive enclosures with a short delivery time, that match their size requirements. This will also remove any extra costs due to oversizing. Component failure and unnecessary downtime is avoided as water and dust are prevented from entering the enclosure. Para memorizar la selección de país es necesario permitir cookies en su navegador. Se ha producido un error. Inténtelo de nuevo. El destinatario recibirá un mensaje de correo electrónico en breve. Nos pondremos en contacto con usted en breve.